Special thanks to my friend Edie for figuring out how to do this. 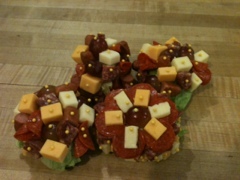 Edie and I decided it would be fun to make meat corsages for our annual winery trip. Cut foam into 2 inch squares, make sure they are 2 inches think to hold the pins. Cut the elastic into 6.5 inch strips and sew into 6 inch circles. Wrap foam in Saran Wrap. Glue elastics to foam. Use pins to secure while drying, but make sure to remove them before they get stuck. Wrap foam with lettuce. Secure with pins. 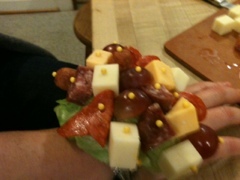 Place meats, cheeses, and fruit on with the pins. 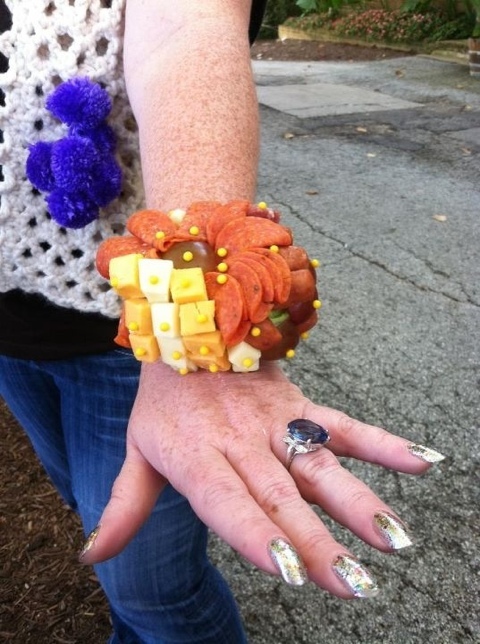 Decorate to your hearts desire. If necessary wrap with Saran Wrap for transport. Please be careful as there are pins involved and these should never be given to children. We tried toothpicks, but they wouldn’t stay in the foam.